Are you looking for a functional yet elegant design style for your new home or remodel? There are a multitude of décor styles to choose from. Adopting a Tuscan Décor style with granite countertops in Denver can make you feel like you are living in the hills of Italy. By using granite countertops in Denver with terracotta tiles, distressed paint, and warm colors a Tuscan inspired home is yours for the taking. Tuscan architecture presents with aged finishes, iron scrollwork, and intricate textures and patterns. 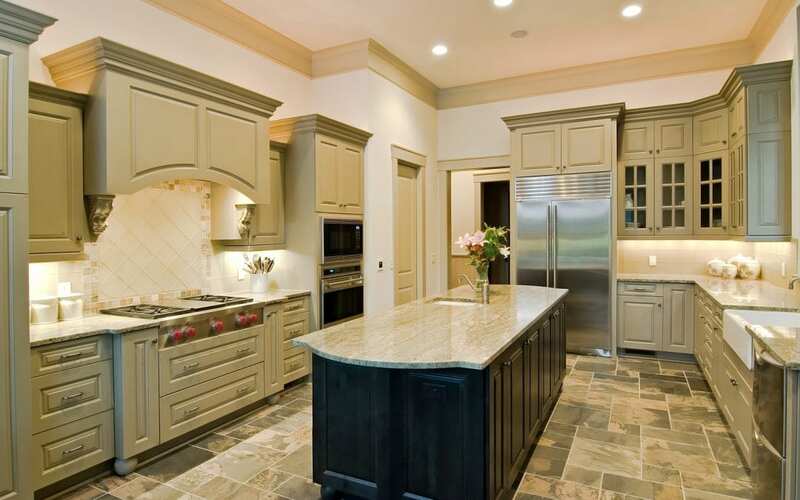 These elements are highlighted with granite countertops in Denver adding sought after elegance to your home. The old Italian craftsmen that built many of the first Tuscan mansions did so with their bare hands. Hand carving granite and terracotta tiles was a must to capture an authentic Tuscan feel. By implementing granite countertops in Denver in today’s home, we give homage to this craftsmanship. Similar to Mediterranean design, Tuscan kitchens were open and expansive to house the immense amount of farm to table cooking that took place. Granite countertops in Denver with large functional islands are reminiscent of this flavor. Choose antique bronze plumbing, cabinet hardware, and light fixtures paired with a creamy beige granite that is highlighted with dark veins of brown, gold, and copper. For a Tuscan farmhouse feel go with a white cabinet and a white granite countertop in Denver with black or bronze hardware and a farmhouse sink. Dark woods with intricate molding and creamy colored granite countertops in Denver give a high-end Tuscan feel if the farmhouse look is not for you. For a Tuscan vibe with a twist choose white cabinetry, and a white granite countertop in Denver with dark veins, and gold hardware. Along with your granite countertop in Denver wrought-iron-items have Italian flair. Hanging candelabras and intricate lighting fixtures will give your kitchen functional light with an old -world feel. In addition, wrought-iron wine racks, pot racks, and counter chairs enhance a Tuscan motif. Italy is well-known for its tiles and ceramics. Finding Italian tile that accents your granite countertop in Denver will give that natural stone feel that Tuscan architecture uses has the foundation for décor. Here are some ideas for the simpler decorative accents once you have chosen granite countertops in Denver. Choosing a warm neutral color palette is essential for Tuscan décor. Accenting these hues with decorative pots and dishes will look very similar to an authentic Tuscan villa. Adding clear jars displaying pastas, olives, and peppers on granite countertops in Denver or on shelving is another artistic touch. Painting techniques using a sponge application has become a signature wall cover for centuries when it comes to Tuscan design. The patterns and highlights can be used to accent the movement and tone of your granite countertop in Denver. These are just a few ways that you can bring an Italian Tuscan inspired design style into your home and kitchen with granite countertops in Denver. If you’re looking to design or redesign your home with a Tuscan Decor but need help with your granite countertop selection, give us a call! We off wholesale direct pricing on all our stone slabs, and would be happy to assist you in the stone selection process!